Quality matters in the Department of Radiology and Imaging Sciences. That’s why the Procedural Safety Committee, initiated in 2015 by Phuong-Anh Duong, MD, chief quality officer and director of CT, identifies opportunities for improving quality in patient care through standardization of imaging protocols. One of the first quality initiatives, led by Matt Hawkins, MD, now assistant professor and director of pediatric interventional radiology at Children’s Healthcare of Atlanta, and Gail Walls RN, MSN, advance practice provider, was the Call to Order/Time Out project at Emory University Hospital Midtown. The project standardized the call to order/time out process to ensure the right patient gets the right procedure on the right side and at the right time for interventional radiology, body, and invasive neuroradiology treatments involving MRI, CT, and ultrasound. The process began in March 2015 by analyzing then-current practices. The team sought the guidance of Pratik Rachh, MD, MBA, quality program manager, with project scope and quality assessment. The team of nurses, technologists, and physicians involved in invasive imaging procedures all were given the AHRQ patient safety survey, which provided eye-opening results. “The main takeaway from the survey was that many team members felt it was just by chance serious mistakes didn’t happen,” recalls Dr. Rachh. A series of process mapping meetings then looked at the essential elements needed from the moment the patient checks in until the time the patient leaves the imaging area. From that work, the team redesigned the call to order checklist and process. After two months of beta testing in early 2016 and subsequent minor revisions, in the summer of 2016 the standardized call to order/time out protocol was fully implemented across the three modalities at Emory Midtown. Emory Midtown’s call to order quality project continues to benefit from physician leadership, thanks to Janice Newsome, MD, assistant professor and newly appointed associate director of the Division of Interventional Radiology, and Zachary Bercu, MD, RPVI, assistant professor. Emory Midtown also has the ongoing leadership of the advanced practice provider Gail Walls, who co-led the project from the earliest stages, along with Susan Reich, clinical sonographer, who was essential to engaging and representing technologists. Efforts are underway to replicate this patient safety initiative at other Emory Radiology locations. 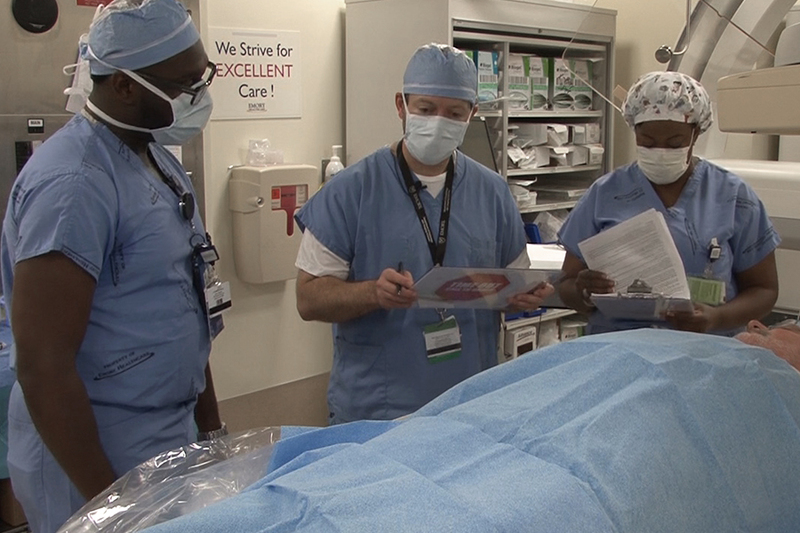 Michael Miller, MD, associate professor and director of the Division of Interventional Radiology, is championing standardization of call to order for IR at Emory University Hospital and the team is seeing encouraging results.